India began well by welcoming Prime Minister Imran Khan and inviting him to jointly work for a terror-free South Asia. Imran had, as the PM elect, already talked of the need for friendly relations with India but had hastened to point out, obviously under his army's prompting, that Kashmir remained the ‘core’ issue between the two countries. India’s hope of the new civilian leadership in Pakistan turning a page for the better does not seem to be coming true so far. On the other hand there are indications that the new Pak regime is likely to do more of the same, play further games against India geo-politically and collude with the Pak army in stepping up efforts to destabilise Kashmir. The posting of a politician as the Governor of J&K by Delhi was meant to deliver a message of ‘softness’ of governance to the people of the state and help them to take charge of their own affairs at the grassroots level in the forthcoming civic and Panchayat elections. The Pak agencies have however taken to new tactics like targeting Kashmiri polic­emen and their families, browbeating any leader of the Valley who expressed pro-India sentiment and forcing ‘closures’ with the help of stone pelters, to create an environ of ‘alienation’. The state administration is on test once again. 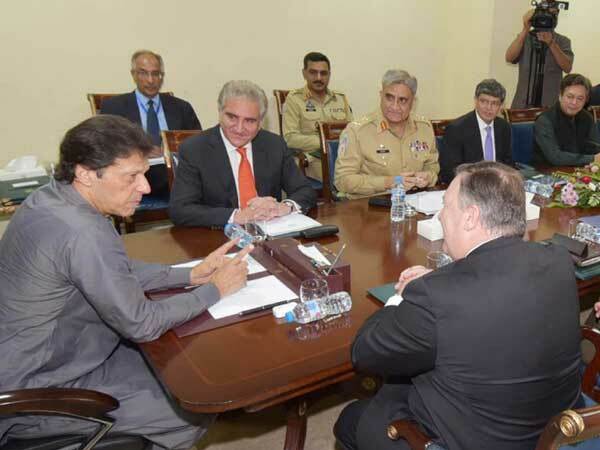 The episode of how the Pak foreign minister, Shah Mohammad Qureshi, a known hawk as far as India is concerned, tried to hedge the content of the first US call made by the Secretary of State, Mike Pompeo to PM Imran Khan gives India a good insight into how the deep state of Pakistan was likely to set the country’s foreign policy in the new regime primarily keeping India in its calculus. A US State Department statement giving out that in his phone call to Imran Khan Pompeo mentioned the importance of Pakistan taking ‘decisive action against all terrorists operating in Pakistan’ and its vital role in promoting the Afghan peace process, was quickly followed by Qureshi denying that there was any reference to terror in that conversation. In an immediate rejoinder the state department maintained that it stood by the original read out of the phone call. It can be presumed that Imran Khan went along with Qureshi, which would suggest that the new PM of Pakistan was taking policy dictation from his army. The latter has been smarting under the rebuke administered to it by president Donald Trump who asked Pakistan to stop providing safe haven to terrorists across the Islamic spectrum - from Al Qaeda - Taliban combine to the India specific outfits including Lashkar-e-Toiba, Jaishe Mohammad and Hizbul Mujahideen and take decisive action against the perpetrators of 26/11 Mumbai attack. This produced a total convergence between India and the democratic world led by the US on the issue of Pak sponsored cross border terrorism. This unity of approach on an important matter of global security is firmly in place much to the chagrin of the Pak army. US has cut financial aid to Pakistan. Indo-US cooperation on security on the other hand is touching a new high. India, however, has to be watchful about Pakistan trying to have its way in Afghanistan at the cost of India by manoeuvring a role of mediation between Taliban and US, in that country. The Pak army has sensed a certain urgency on the part of the US to sort it out in Afghanistan for an early pull out of the American troops from there. It might be useful for US to revisit the idea of ‘Geo- political pluralism’ floated by president Obama in his time in relation to Afghanistan and define the role of India there in unambiguous terms. The great success of India in isolating Pakistan in the world community as a harborer of Islamic terror has been reinforced once again at the Bimstec summit at Kathmandu this week. The Kathmandu Declaration has called for a crack down on the cross border movement of terrorists as part of measures to fight extremism and also laid emphasis on greater connectivity in the region. It focused a great deal on counter- terror measures and buttressed India's stance on the threat of terrorism emanating from Pakistan. The seven Bimstec countries recorded their commitment to combat terrorism and prevent financing of terrorists from territories under their control. The US- Pak spat on Pompeo’s call to the new Pak PM shows a calculated recalcitrance that the Pak army has adopted towards the US in the belief that as a key player in the Saudi-led Organi­sation of Islamic Conference (OIC) it remained a recognised American ally in the unfinished 'war on terror' and that in dealing with the Afghan conundrum Pakistan was counted by the Pentagon as a part of the solution not the problem. Pakistan army wants to be on the right side of the US but without giving up on its visceral antipathy towards India. While it is engaged in a game of wits with the US under Donald Trump, the first American president who had shown zero tolerance towards Islamic extremism, it is totally focused on settling scores with India and having its way on Kashmir. A steep rise in the terrorist violence and instigated civic unrest in the valley is on the cards. A key to dealing with it is to identify the Pak agents within the administration and outside and render them ineffective. A large number of scholarships for university education within J&K and outside should be announced on the basis of the recommendations of collector and SP of districts and free travel and logistic facilities should be provided for the visits to prominent Sufi shrines in the state. Liberal funding of entrepreneurship and startups anywhere in India should be offered to Kash­miris. Families of policemen engaged in intelligence work should be safely relocated and specially provided for. Focus should be on the revival of civic life in the valley. Development plans should have the stamp of consensus of the people of the concerned districts and they should emanate from below as far as possible. The district plans should be there in addition to the projects at the state and central levels. Moreover, army and para military are to be projected as forces taking on terrorists while all situations of civic order should be considered as the area of primary responsibility of the state Police and its armed contingents. Handling of J&K requires a 3-point approach- relentless confronting of terrorists in intelligence-based operations by army keeping collateral damage to the minimum, identification and prosecution of Pak agents behind incidents of civil disorder and district level adoption of development projects identified by the collector and SP in their outreach exercise. All of this will create a turn around howsoever slow it may appear to be in the offing. The state is still not normal because the administration is not doing whatever normally it was supposed to be doing anywhere else in a democratic dispensation.